I just got home from my interview! It went really well and they told me they would let me know tomorrow or the next day so I'll keep you posted!! Remember me saying that I wanted to take the picture of the boys for our Christmas card this past weekend? Well I did and here it is!! Grande is holding Ozzie, Short (in the middle) is holding Woody and Tall is holding Brody. Great photo!! Congrats on the interview going so well. Hope you get it! Have my fingers crossed that you will get the job. Very handsome family. Fingers and toes crossed for you in regards to this job. What a cute photo! 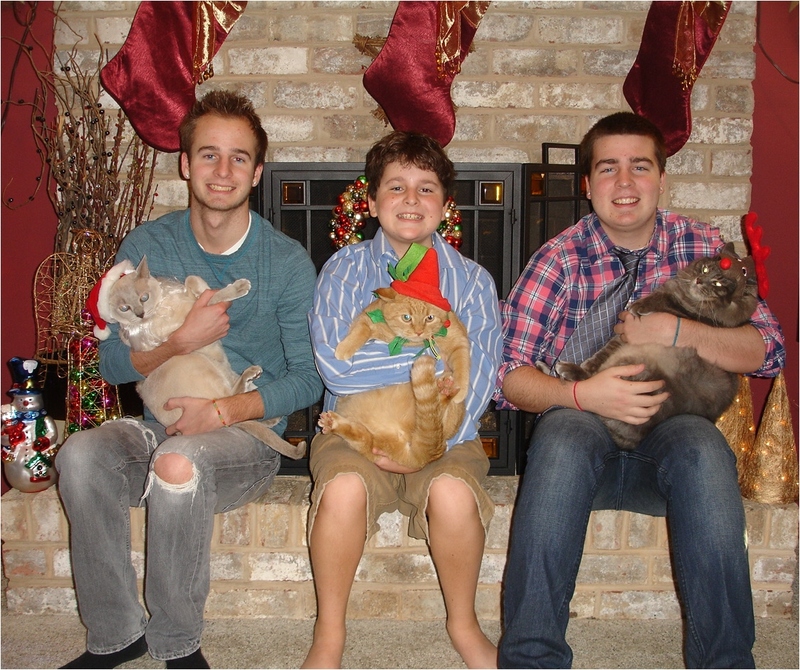 It's quite an accomplishment getting three boys and three cats to cooperate for one photo. Good job! Speaking of jobs...good luck. Love the photo. The hats on the cats are great! Your sons look happy to oblige as well. Great news on the interview! A slam dunk I'd say! You have such a beautiful family! Have fun on the holidays! and that is truly a christmas photo to behold... the cats are sitting still better than my child does!!! Great photo - I'm sure it wasn't easy to do either! Good luck on getting the job. Love your Christmas card picture--such a cute touch to include the cats even though it looks like they really don't want to be there. Merry Christmas Eve and a Recipe!! Meet Me On Monday!! Christmas Edition!